We do the majority of desktop deployment using imaging. Imaging allows us to bypass most of the redundant manual desktop software configuration. But one part of the deployment process we had struggled with was configuring Outlook. Once the machine was placed, the technician had to login to the computer as the user and setup the Outlook profile. This was a twofold problem; the technician often didn’t know who the computer was going to be assigned to, and we never give out user passwords to technicians. Our solution had been to reset the user’s password, tag every machine with the user’s login name and temporary password, login as the user, setup the profile, then forced the user to change their password the next time they logged in. What a pain. 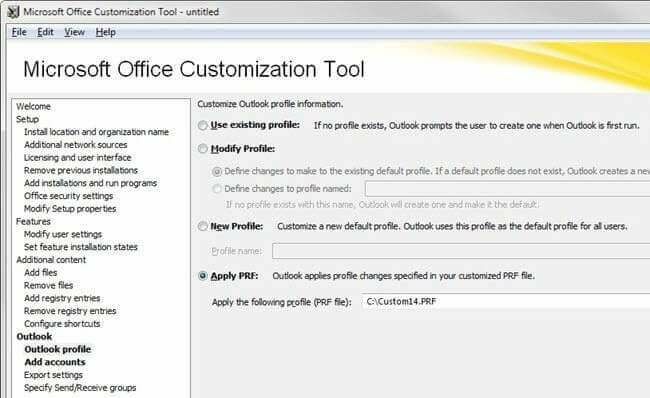 I recently discovered you can pre-configure Outlook settings and save them to a .prf file. These .prf files are text files that can be created by using the Custom Installation Wizard and exporting the settings. You can also use a text editor to manually edit an existing .prf file. Check out this whitepaper for more details regarding which settings can be deployed using a .prf file.